The music of Southeastern Europe has deep roots in the area. On a recent evening at Amnesia in San Francisco's Mission district, a young, hip, tattooed crowd packed the dance floor as the musicians onstage played high-energy music. But it wasn't rock 'n' roll. They were folk dancing to a tune in 7/16 by Brass Menazeri, a nine-piece band that plays Serbian dance music. The dancers snaked around the floor holding hands in a long line as the ancient sounds of Eastern Europe filled the air with uncontained joy. Brass Menazeri may be the most visible group of musicians playing the music of Greece, Macedonia, and Serbia in the Bay Area, at least to people outside of the folk music community. But the region, particularly Berkeley and Oakland, has long been a hotbed of Balkan music. The Bulgarian women's choir Le Mystère des Voix Bulgares (aka the Bulgarian State Television Female Vocal Choir) came on the scene in the late 1980s and is largely credited with kicking off a worldwide surge of interest in the music that continues today. Its first hit album, Le Mystère des Voix Bulgares (originally recorded in the mid-Fifties but released in 1986), featured traditional songs sung in complex polyphonic arrangements. But even before the group's performance in Berkeley in 1988, Balkan music was being played here. "There was a significant community in the Bay Area that was deeply involved in Balkan folk music and dance," said Shira Cion, executive director of Kitka, the Oakland-based women's choir that is internationally known for its renditions of Balkan, Slavic, and Caucasian vocal music. "Some of these folks had been teaching and practicing this music since the Fifties. At that time, the Balkan scene was mostly Americans captivated by the beauty, complexity, and community-generating power of the songs and dances from that part of the world. Some of those folks went to Bulgaria and Yugoslavia to study from indigenous masters there, but most learned from recordings and each other." When Cion first came to the Bay Area in 1987, she says there were two women's choirs, Kitka and Savina; a number of Balkan dance bands; and the Westwind International Folk Ensemble. 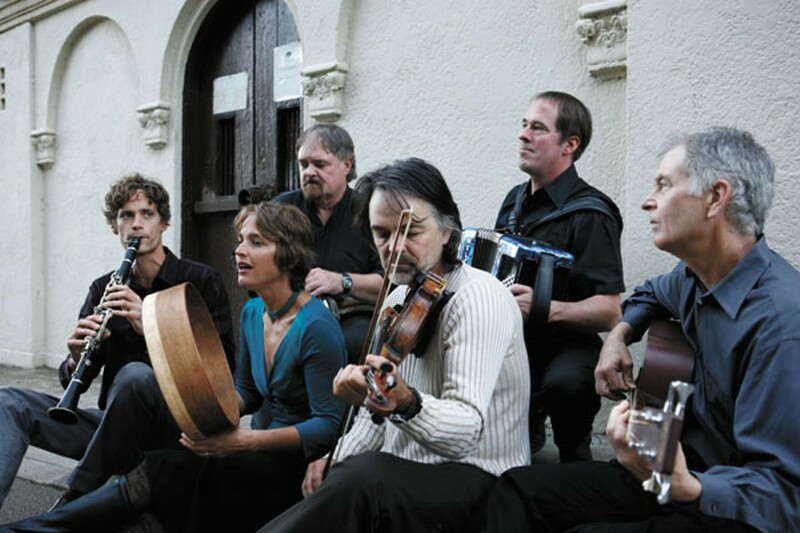 After Le Mystère des Voix Bulgares' Berkeley performance, however, Balkan music became more popular locally. "Kitka had just booked the Oakland Ensemble Theater for what was to be our biggest ever production, a joint concert with the Russian folk dance group Neva, for the week after Le Mystère's Berkeley date," recalled Cion. "We were nervous; we didn't think anyone would be interested in another Eastern European choral event right on the heels of Le Mystère, but we had a sold-out show and turned away hundreds of people. Those songs and vocal techniques suddenly captivated people." Many people in the Bay Area Balkan scene first met as members of the Westwind Ensemble, including David Nadel, who later founded Ashkenaz. "David started Ashkenaz because he got interested in Balkan folk dancing," said Lise Liepman, a former Balkan music consultant for and member of the Ashkenaz board. Liepman also plays in two bands — Edessa, which performs the music of Macedonia, Armenia, and Bulgaria; and Ziyiá, a group that plays traditional Greek music. "At first, people were dancing to records, but when people started learning how to play the music, David invited them to come and play Ashkenaz," she said. "He gave everybody stage time when they were beginners." Kitka also helped launch the careers of many talented musicians over the years, including Juliana Graffagna of Janam, formerly known as the Black Olive Babes. "There's something deep and elemental about the music for me," said Graffagna, who sang with Kitka for twenty years and continues to do so occasionally. "I don't know if it's a past life thing, but I'm drawn to it. I always wanted to be in a rock band, but never found music I wanted to do until I discovered Balkan rhythms and tonalities. I started Janam to blend traditions and play this exciting, rhythmically challenging music." Graffagna, who is Italian, studied Russian in college before joining Kitka. "My natural singing voice has a folksy open-chested quality," she said. "It was suited to Balkan music." When she started Janam (meaning "dear one" or "sweetheart" in Bulgarian, Macedonian, and Turkish), Graffagna pulled together some of the Bay Area's best Balkan musicians, including Peter Jaques, founder of Brass Menazeri, and Tom Farris of the Helladelics and Izvorno IcePick. Graffagna met Farris at a Balkan music camp in Mendocino that's sponsored by the Eastern European Folk Life Center. "They put on a gathering every summer where people sing, play traditional music, and dance," she said. "You take classes from musicians from the Balkans during the day and, at night, there are big dance parties. That got me hooked. The rhythms are in 7, 9, 18, and 11. When I danced to them, I understood the music on a deeper level." For Farris, who had always played drums in rock bands, the Balkan camp came as an epiphany. "The music took over my life," he said. "Being a rhythm-section kinda guy, the rhythms grabbed me. I grew up with prog rock, which sometimes added or dropped a beat. In the Balkans, there's a rationale to the odd time signatures. The feel is directed at the dancers, with tunes that can be slow, slinky, and trancey or fast and energetic. Melodically, there are a lot of ornamentations, those wiggly notes you never see written on the page. The Balkan masters can take a simple phrase and play it over and over again and still make it compelling." Jaques, too, was attracted to the odd time meters. As a member of a clown cabaret performance group, he was trying to write music that broke out of the standard 4/4. An accordionist friend he was playing with asked him to attend that year's Balkan camp. "I went and had my mind blown by all the incredible talents, including Michael Ginsberg of the Zlatne Uste Brass Band, one of the groups that kicked off the current Balkan wave, if you can call it that," said Jaques. With Balkan music being played regularly in the Bay Area, is the genre getting more popular, or are more people just aware of it? "It's hard to know," said Jaques. "I've been playing it for twelve years and there does seem to be a current wave of interest, maybe because you have bands playing this traditional music with an American perspective. Brass Menazeri plays rock clubs, New York's Slavic Soul Party adds soul and funk to Balkan beats, and Janam blends in American folk music. That wouldn't have happened twenty years ago."